Our twins were our first pregnancy – so everything was a learning experience. The following are suggestions for twin pregnancies, but I’m sure that there are some ideas here for singleton pregnancies, too! 1. Meet with a nutritionist or dietician familiar with multiple pregnancies: The nutrition levels ARE different for a twin pregnancy – so is the weight gain expectations. For instance, I was striving for 80 grams of protein for the first 24 weeks before I found out that I should be eating 110 grams! 2. Make sure you establish an exercise routine - walking around the neighborhood, water aerobics, or something early in your pregnancy. Remember, you will be carrying two babies – this is real hard on the back and legs, so work on some strengthening exercises. Work with your ob on this - chances are you are going to be severly limited with what you can do after 28 weeks, so get your excercise in early! 3. 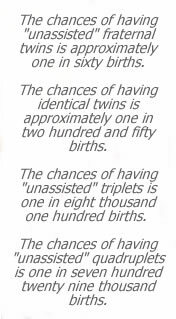 Make sure your ob is experienced with multiple births. One of our friends stayed with their family gp after learning they were expecting twins, and almost lost one of the babies because the doctor missed a few warning signs. Ultrasounds for multiple pregnancies should be scheduled at least once a month - especially if you are having identical twins! You should also be going to the doctor at least once or twice every month for the first 28 weeks. 4. Make sure you buy a body-length pillow - it will come in handy later - both as you try to sleep and after the babies are born! There are all sorts of different styles. You can spend as much as you would like on a pregnancy pillow, but I don’t think that’s necessary. The one I used (and the boys enjoy!) is the $10 model from Wal-Mart. There are several websites, such as www.meditationgeneration.com, that have great made-for-pregnancy pillows! 5. Buy two or three REAL maternity t-shirts. Leave room for the twins to grow! There are going to be days that you very much appreciate them during the last few weeks of pregnancy and first few weeks after birth. 6. Find a good maternity support belt. I was having contractions at 24 weeks because of the weight of the twins. The belt saved my back! Again, there are several places on the web to find the specialty belts – I purchased mine at a maternity outlet store. 7. Find a twin or multiples class – even if you plan on taking a birthing class. I CANNOT tell you how important and informative this class is! I learned more in the first four hours of that class than at any other birth or parenting class. I would suggest taking it by week 20 of your pregnancy, if possible. Not all hospitals offer the specialty class. We had to travel to Portland for ours. I have learned that classes aren’t well advertised, so check with your insurance company, ob, local twins club, hospitals and universities, and the greatest resource - other twin parents - to find one in your area. We learned about our local class through another set of twin parents who had taken one. Having trouble locating a class? Contact us, and we’ll try to help. 8. If you are currently working, be prepared to go to half time as soon after 20 weeks as possible, and be prepared to stay home at 28 weeks. Not every twin pregnancy does this, but a majority do. I was so tired at 20 weeks that I was falling asleep at my desk by 2. Our doctor had me working half-time at 20 weeks, and then I was on medical leave beginning week 27. I was put on modified bedrest at 28 weeks - and taking a two hour nap in the morning, and a two hour nap in the afternoon - and still trying to sleep 8 - 10 hours every night. Of course, you have to get up and go to the restroom every three hours, but still . . .
9. Speaking of which - check with you personnel department about maternity leave. In Oregon, Mom is allowed up to 12 weeks protected leave before the baby comes, 12 weeks after the baby is born, and then another 12 weeks a year for Family Medical Leave. Dads are allowed up to 12 weeks after the baby is born, and then the 12 FML. If Daddy can take the time off, try and see if he can't stay home the first six weeks (or later if you have someone staying with you for the first two), and then a day or two a week until the 12 weeks are all used up. The middle of the work week is best - that way YOU can get some rest during the day! We didn't have any family help, so Tony stayed home full-time the first six weeks, and then 1/2 days for the next 12 weeks. 10. Prepare yourself for bedrest! Get pictures gathered together for photo albums, baby announcements to address - heck, CHRISTMAS cards to address for that matter - you're going to be pretty busy next Christmas! Find novels you'd like to read, and invest in a small cooler that you can fill with water and snacks - you'll want to be near the bathroom, and if your house is like ours, the kitchen and bathroom are far, far apart. I was fortunate - I only had to endure modified bedrest! We’ll have a bedrest surivival guide posted soon with other ideas, hints, and tricks. 11. Bags - pack two hospital bags, one for you, one for hubby. We’ll have a “what to pack for the hospital’ list soon! 12. Invest in paper plates, plastic silverware, and disposable cups. With any new baby – especially twins! - you won't feel much like doing dishes the first six weeks, and it's easier to throw plates away and tidy up then spending time on your feet washing dishes or emptying and filling the dishwasher.